Gained an almost mythical status. Over a number of years we have developed a small range of incredibly attractive hi-viz pop ups. 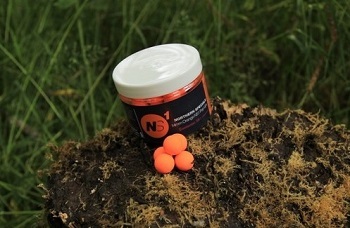 Combining a selected blend of potent flavours and attractors with a high level of a vivid bait dye, we created these CC Moore NS1 Pop Ups Orange that, due to their unprecedented level of success, have gained an almost mythical status. Tip: To really increase the potency of your Northern Specials, give them a coating of the supplied booster liquid, let it dry in and then repeat this as many times as necessary. This gives them a huge boost of attraction, making them simply irresistible. Soaking NS1’s in liquids, excessively or repeatedly adding liquids to them will reduce their buoyancy. We strongly advise that baits are given a light coating and are fully dried before use. This can be repeated to increase their attraction, but the more times this repeated, the more their buoyancy is likely to be reduced. It is essential to be fully dry them before use if the original level of buoyancy is required.